If you turned from Holborn into Red Lion Street, Manfield’s business could be found in the 6th house from the corner on the right-hand side. The building that provided Isaac Manfield and his family with a home no longer exists. The whole block between Red Lion Street and Hand Court is now taken up by the modern steel and glass MidCity Place, but the Red Lion Street section used to consist of 15 houses, that is, excluding the corner properties. Although Manfield is listed in the Street View index as a wire worker, he was much more. The elevation at the top of this post already gives us a clue that his business entailed more than the production of wire baskets as he styled himself “importer & dealer of foreign birds”, but we will start with the wire business. 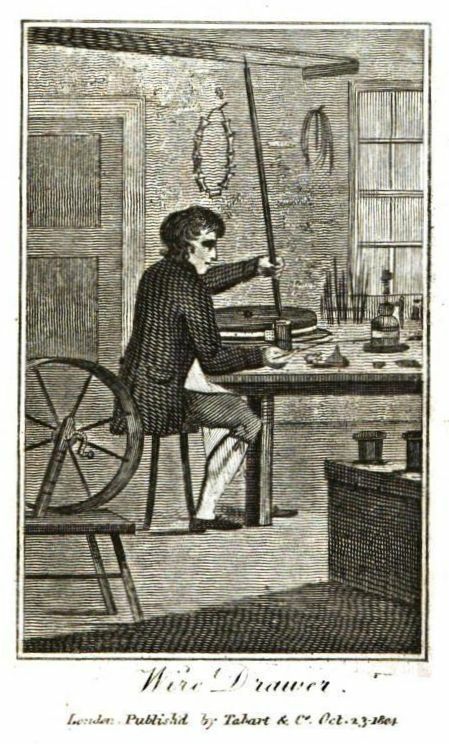 According to part 3 of Tabart’s Book of Trades (1807) a wire-drawer could earn from one to two guineas a week, but as Manfield was the owner of the business and not just a workman, he must have been able to make more. 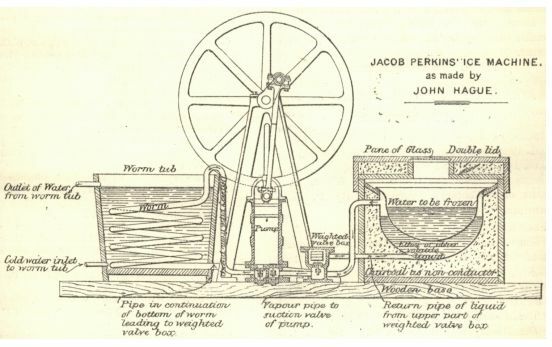 Tabart describes the various stages of the wire production (see p. 56 here) and depicts a wire-drawer. Wire-workers produced all kinds of wire in different metals and one thing that could be made with the wire was bird cages. And this is probably where Manfield’s second line of work came from. A wire-worker who produced cages might as well sell the birds to go with the cage. The cages Manfield sold were famous enough to end up as examples in the Boys’ Own Book and in the extracted version The Little Boy’s Own Book of Sports and Pastimes. 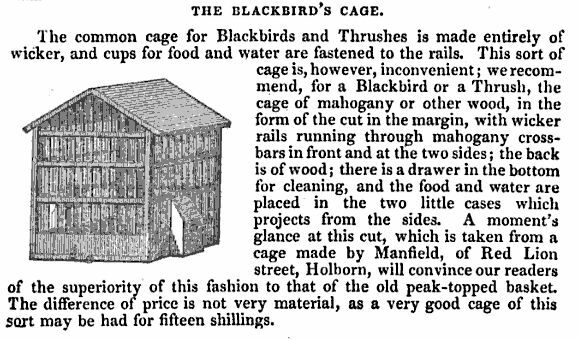 Isaac Manfield, who had started the business in Red Lion Street in 1820, insured his property in 1828 and described himself then as “wire worker and bird cage maker, bird stuffer and dealer in birds”, so not just live birds, but also stuffed ones. 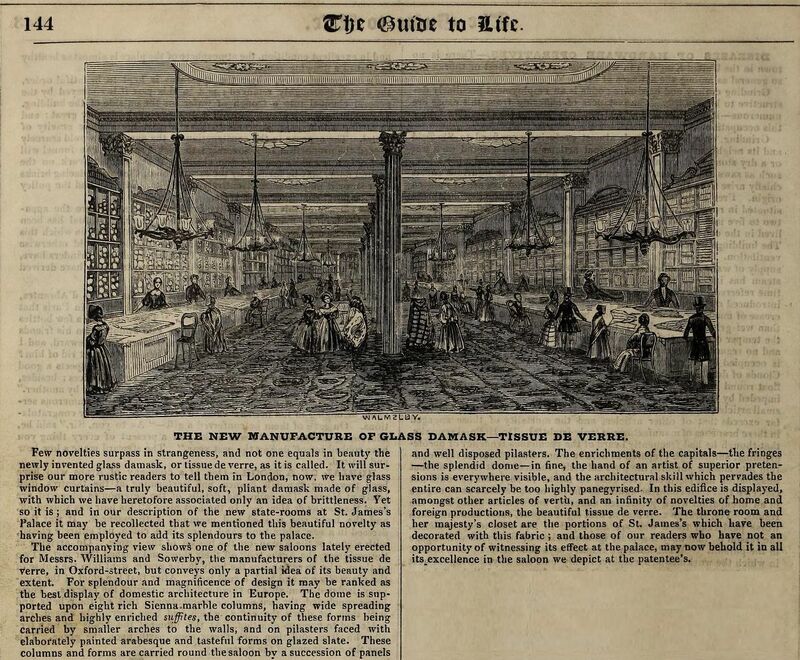 Isaac placed various advertisements in the newspapers to announce the arrival of newly imported birds from India or Senegal; one of the advertisements also mentioned that he could supply millet seed. Isaac died in 1835, two days after he made his will on 21st of February in which he says he is “of sound mind but weak in body”. His signature certainly does not look as if he is in the best of health. Isaac left all his wordly goods to his wife Hannah, who registers probate to the value of £600. She continued the business until ± 1850. She was still listed in the 1848 Post Office Directory, but no longer in the one for 1851. The shop at 6 Red Lion Street is taken over by Francis Kidner, a butcher. Isaac and Hannah’s son Isaac Robert (born 1826) seemed to have had no interest in the busines as he is listed in the 1851 census as an ironmonger’s clerk and in the 1861 census as a brass founder’s clerk in Warwickshire. Was he perhaps working for his brother-in-law? Also living at 6 Red Lion Street when the 1841 census was taken, is ironmonger James Goddard and his wife Rebecca. She was the daughter of Isaac and Hannah and the marriage between Rebecca and James had taken place in November 1840. 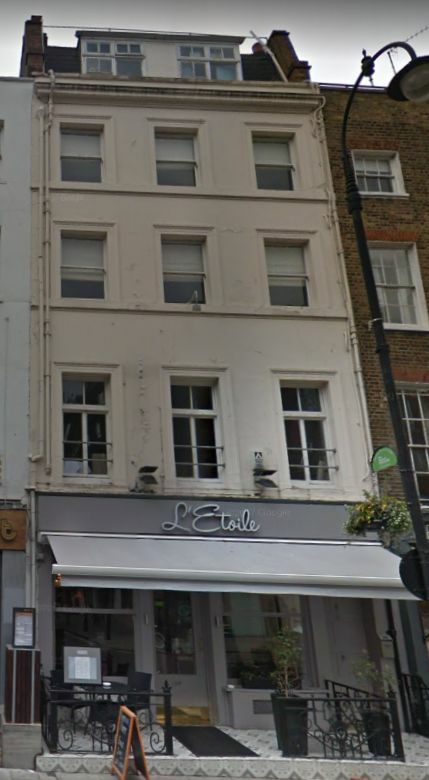 James and his brother Joseph later moved their business to 30 Red Lion Street and 68 Tottenham Court Road. Rebecca died in late 1847 and in 1850, the widower married Rebecca’s sister Susanna Harriet. Something must have happened to James as in 1853, Susannah married Joseph, James’s brother. The strange thing is that she is then still called a spinster, but there can hardly be any confusion as she is definitely listed as the daughter of Isaac Manfield. Another possibilty is of course a divorce, but before 1858 divorce records were not kept in a national register, so are harder to find. 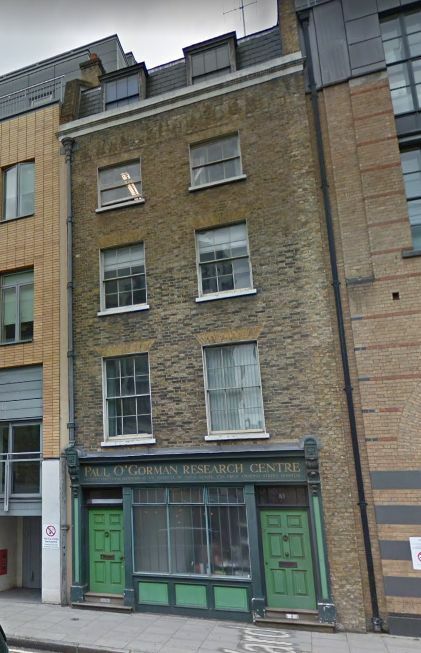 Whatever happened there, Joseph and Susannah were living at 68 Tottenham Court Road at the time of the 1861 census and with them Hannah Mansfield, her mother. Hannah died in 1864. 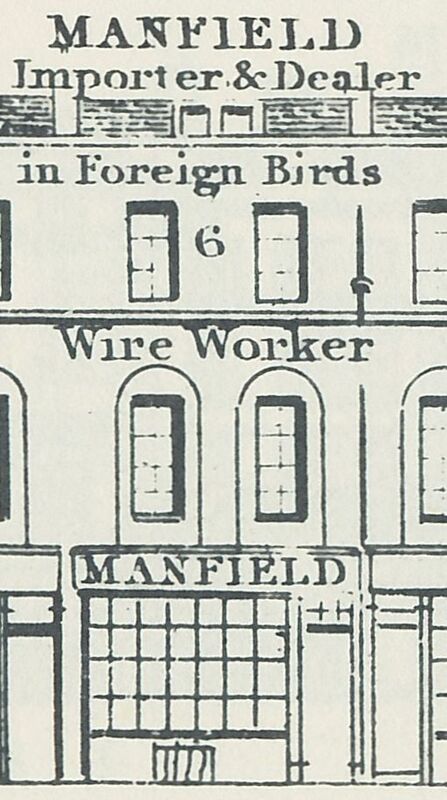 If you think that the wire worker’s business had ended with Hannah Manfield’s termination of the business at 6 Red Lion Street, you are mistaken, as Joseph Goddard’s Tottenham Court Road business continued the tradition, although – as far as I know – not with birds, stuffed or otherwise, but certainly with metal wires as “music pin & string manufacturers; agents for Smith & Houghton’s patent steel music wires” (Post Office Directory, 1890) and all sorts of other pianoforto supplies. More on the Goddards when I write about 68 Tottenham Court Road. John Meabry’s shop was situated at 1 Broad Street, on the corner of Museum Street. Museum Street and opposite Drury Lane used to be the point where High Holborn ended and Broad Street began, but nowadays the two roads are both called High Holborn. Not only has the name of the street where Meabry had his shop disappeared, the plot on which the shop stood is now just a piece of pavement in front of the entrance to the Shaftesbury NCP car park. Horwood’s 1799 map showing the corner property. The southern section of Museum Street used to be called Bow Street. 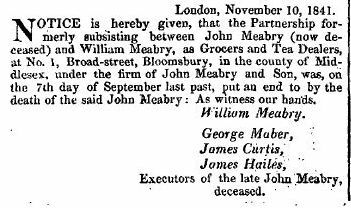 But back to John Meabry who continued to run his grocery shop at 1 Broad Street. The London Metropolitan Archives have a document (MR/B/C/1804/015), dated 1804, pertaining to be a “Surveyor’s affidavit confirming that 3 houses erected and built on the north east corner of Broad Street in the district of Saint Giles and Saint George, Bloomsbury, belonging to John Meabry, meets the requirements of the Building Act”. Unfortunately, the document is “unfit for consultation”, but it does seem to indicate that the property shown above this post was built for Meabry himself. 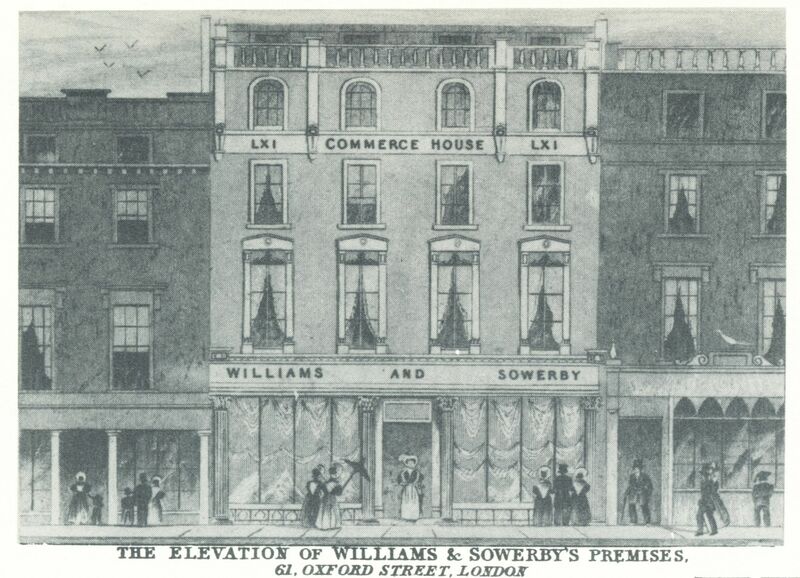 From 1830 onwards, the business was kown as Meabry and Son, as son William (born in 1806) became his father’s partner. Son Charles (born 1807) also seems to have worked in the shop, but he was never a partner. The Yale Center for British Art has an undated trade card for “Constable & Compy : successor to John Meabry & Son : wholesale and retail tea, coffee & grocery warehouse : No. 1 Broad Street, Bloomsbury, London” (see here). 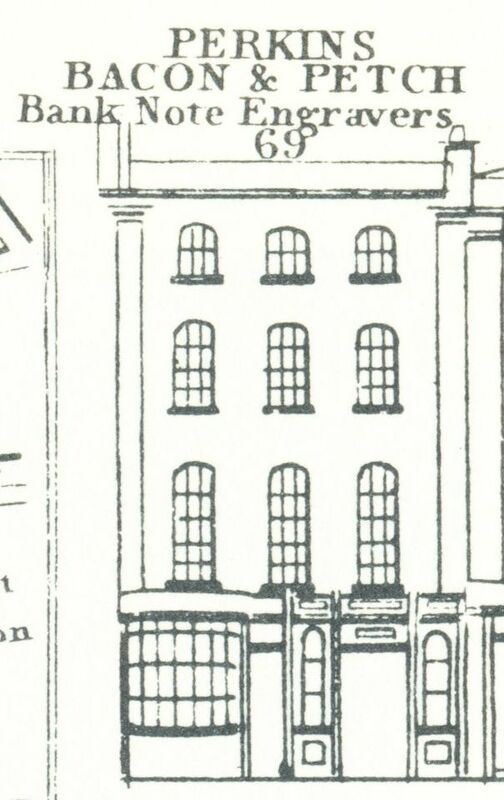 The 1843 Post Office Directory lists Constable & Phillips, grocers, at 1 Broad Street. Henry Constable was still there in 1848, but by 1851 the grocery shop was run by William Palmer & Co. (Post Office Directories). This would be the end of this post, but there is a little more to say about the final resting places of some of the Meabry family members. In 2003 Oxford Archaeology (AO) undertook some work at St. George’s, Bloomsbury, prior to the redevelopment of the crypt. (7) They excavated seven vaults where they found a total of 781 burials, dating from 1804 to 1856. Most of them could be identified, and yes, you probably guessed, some of the Meabry family were indeed laid to rest in one of St. George’s vaults. AO found the remains of John Meabry, his wife Elizabeth, their daughter Louisa, who died aged just eight years old, and their son William. The coffins were found to have been rearranged at some point in the past, probably in 1856 when the order was given to seal off the vaults. People buried later were found on top of earlier burials, so it was impossible to determine who was originally buried in the same ‘stack’. However, families were usually still found together in the same vault, albeit not necessarily in the same stack. The Meabrys were all found in vault 2. 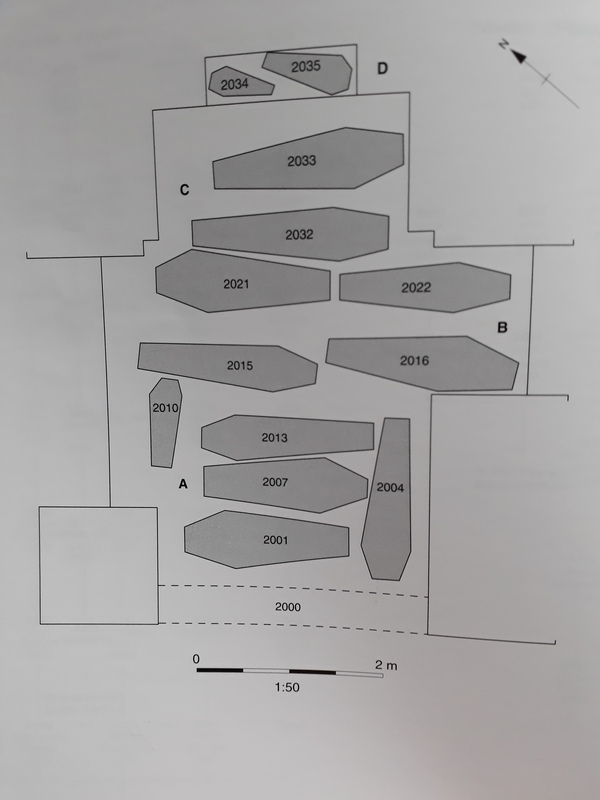 Each coffin has been given a number by AO: John (2032), Elizabeth (2014), William (2007) and Louisa (2022). Elizabeth’s coffin was found underneath number 2013, but the others were all found at the top of their stack. Besides the information on these burials, the OA also lists memorial plaques in the church which gives us another tangible link to John and Elizabeth, as one of the church walls apparently holds a memorial plaque for the couple. (1) LMA MS 11936/368/565145. The insurance record gives the address as 1 Bow Street, Bloomsbury, the old name for the southern end of Museum Street. (2) PROB 11/1922/75. Martha died between January 1837 when she wrote her will and January 1840 when probate was granted. (3) England & Wales, National Probate Calendar (Index of Wills and Administrations), 1876. The executor was her nephew John Jeffryes Oakley. Her estate was valued at under £200. (4) England & Wales, National Probate Calendar (Index of Wills and Administrations), 1887. 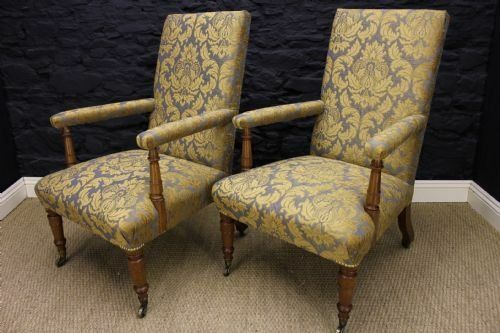 The executors were John Jeffryes Oakley and William Alfred Oakley, nephews. Her estate was valued at over £6,500. (6) England & Wales, National Probate Calendar (Index of Wills and Administrations), 1872. His estate was valued at under £1000. (7) ‘In the vaults beneath'. Archaeological recording at St George's Church, Bloomsbury by C. Boston, A. Boyle, J. Gill, and A. Witkin. Oxford Archaeology Monograph No. 8 (2009). This blog post has been written jointly with Julian Pooley of the Nichols Archive Project (see here) who kindly shared his extensive knowledge of the Nichols family. The story of the Nichols printing office starts in 1759 when John Nichols (1745-1826), the son of Edward Nichols, a baker, is apprenticed to printer William Bowyer. He obtained his freedom after the customary seven years, but did not set up business on his own. He entered into a partnership with his former master and in April 1766, their first joint publication came from the press, which was then situated in Temple Lane, Whitefriars. (1) Shortly afterwards they moved the business to Red Lion Passage, Fleet Street, frequently referred to as Red Lion Court. The take-over of the Nichols business by Valpy was most likely not one by a new kid on the block, as Valpy had been apprenticed in 1801 to John Pridden and later, after the death of John, to Humphrey Gregory Pridden, John’s son. Another son of John, John junior married Nichols’s daughter Anne. More on Valpy in The Gentleman’s Magazine of 1855. Despite his move to Westminster, Nichols remained in possession of the Red Lion Passage property and Valpy paid the tax as ‘occupier’ until 1841, by which time he had retired. Taylor’s business was situated to the south of the Red Lion pub, but Nichols’s property was more towards the north, on the other side of the Red Lion pub. 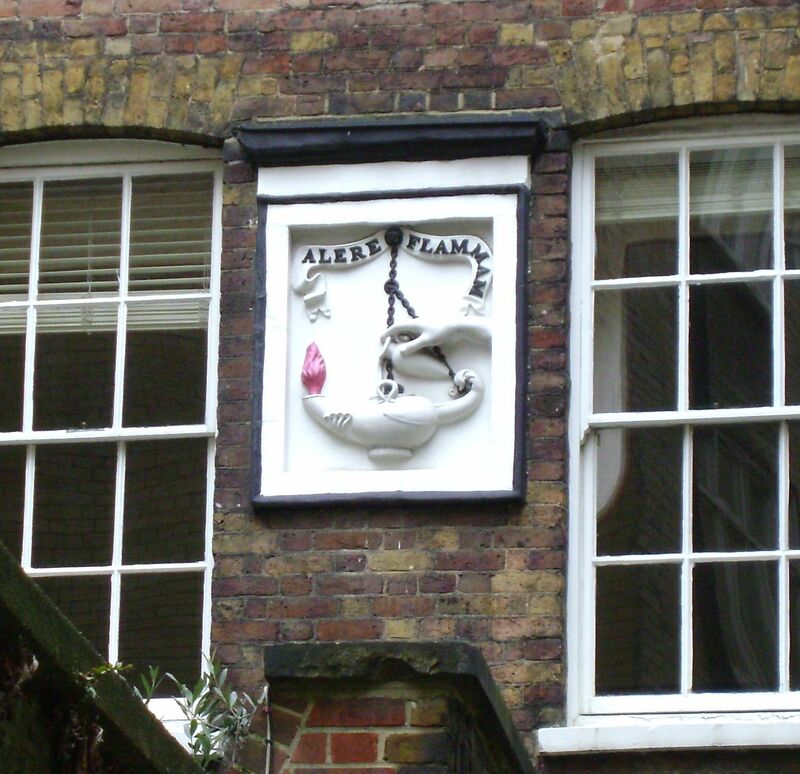 The property is sometimes considered to be the one that is still there and has the ‘Alere Flammam’ relief set into the wall, but that was the motto of Taylor & Francis. Valpy used the digamma symbol on some of his publications. 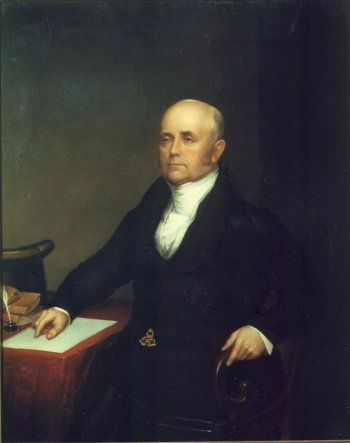 John Nichols’s son, John Bowyer Nichols, obtained his freedom of the Stationers’ Company in 1800 and became a partner in the firm. After the death of his father in 1826, he continued and enlarged the business, which was eventually spread across 23, 25 Parliament Street and 20, 22, 24, 26 King Street. In 1896, the Office of Works requisitioned the leases of these properties in their efforts to widen Parliament Street and to build one large office which now houses Her Majesty’s Revenue & Customs (see the blog post on John Burder of 27 Parliament Street for more information). (8) The Nichols firm relocated to Parliament Mansions, Victoria Street, later usually referred to as Parliament Mansions, Orchard Street. The census of 1841 list Thomas Brickwood, a carpenter, and his wife on the premises in Parliament Street; in 1851 James and Rachel Brown, messenger and housekeeper to Nichols & Son; in 1861 and 1871, Rachel is still there as housekeeper; in 1881, Edmund W. Howick or Horrock, a printers’ warehouseman, unemployed, and his wife Mary, housekeeper, presumably to Nichols & Son, although that is not stated in the census and why Edmund is unemployed and not working for the Nicholses is also unclear; and in 1891 Sarah Sidery, a widow, is keeping house, presumably for Nichols. 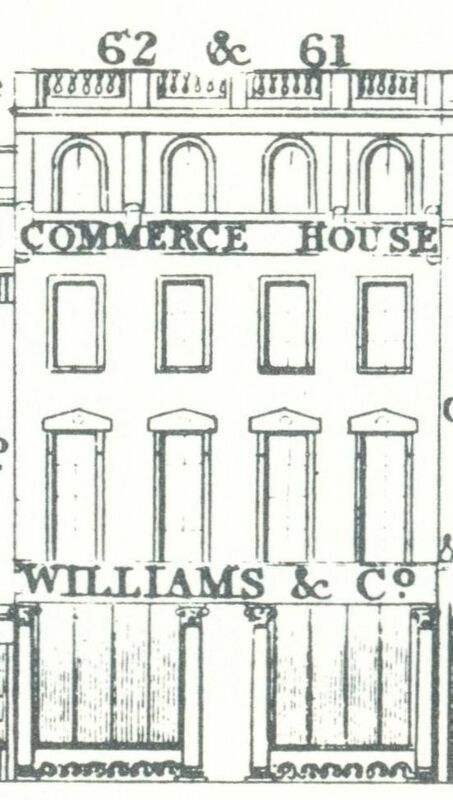 According to the Post office Directory of 1856, the Nichols firm also rented out offices at 25 Parliament Street to William John Thoms, secretary of the Camden Society (established by the Nicholses in 1838), the Liverpool Water Works Company, and to Stephen William Hy, parliamentary agent. And in 1860 to William Moxon, contractor, Gilbert Thomas Field, election agent, William Paul Gale, civil engineer, William John Thoms, secretary of the Camden Society, and to Thomas F. Gilbert, secretary of the National Society for the Amelioration of the Poor Laws. The housekeeper must have been quite busy. For further information see J. Pooley, ‘”The Most Despicable Drudge in the Universe”? Ambition, Assistance and Experience in the papers of John Nichols and his family, 1765-1830’ in Michael Harris, Giles Mandelbrote and Robin Myers, eds., Craft and Capital (forthcoming), or any of his other publications on the Nicholses (here) and The Nichols Archive Project. (1) K. Maslen and J. Lancaster, The Bowyer Ledgers, no. 4603, James Elphinston, The Principles of the English language. (2) PROB 11/1036/267. J. Nichols, Literary Anecdotes of the Eighteenth Century (London, 1812) vol. 3 pp. 277 and 285. (3) Determined by comparing Land Tax Assessments with various Directories. (4) J. Pooley and Robin Myers, ‘The Nichols Family (1745-1873)’ The Oxford Dictionary of National Biography (Oxford, 2004-ongoing). Online here, but subscription required. (5) The London Gazette, 2 January 1819. (6) See for instance his advertisement for Stephens’ Greek Thesaurus in The Morning Chronicle of 18 September 1820. (7) Bodleian Library, MS. Eng. lett. c. 354 ff. 221-2. Ralph Churton to John Nichols, 16 Feb. 1820. (8) National Archives, Kew, WORK 12/81/8. (9) Old Bailey case t18220220-91 (online here). (10) See www.carolineshenton.co.uk quoting Bodleian Library, MS. Eng. Lett. c. 6165/3/f. 302: John Gough Nichols to John Bowyer Nichols, 17 Oct. 1834. (11) Anon [G.E. Dunstone], A Short History of the House of Nichols, 1699-1938 (London, 1938). 14 Charlotte Street (now renumbered 30) is situated across from what was then called Bennett Street and is now part of Rathbone Street. 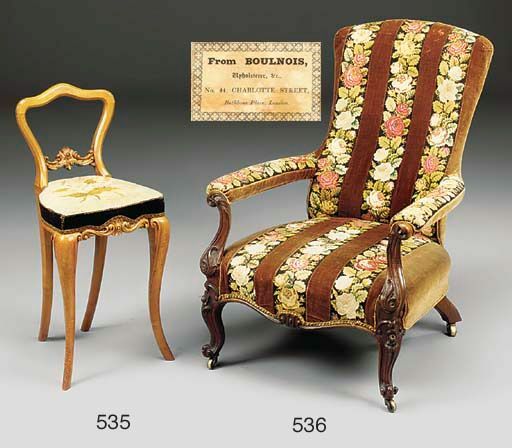 In 1831, John Boulnois had started his furniture business at 44 South Molton Street. The previous occupant of that shop had been James John Cuthbertson, an ornamental painter, who had died in January, 1831, just 28 years old. 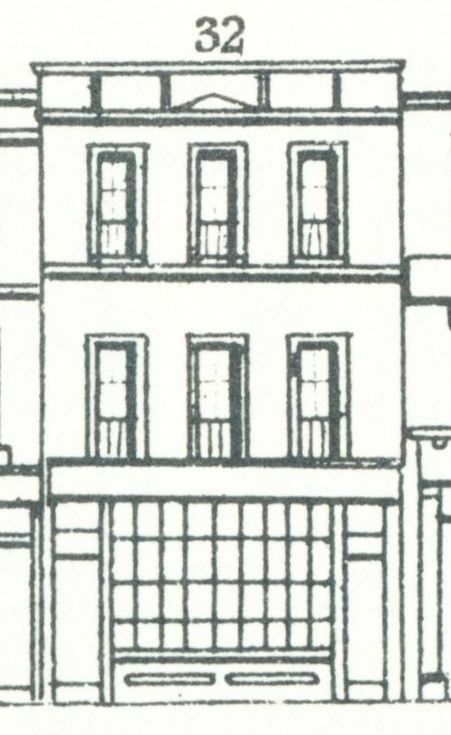 In 1835, Boulnois extended his business by opening a showroom at 11 Davies Street, but having the business in two places proved inconvenient and in early 1839, he entered several advertisements in the newspapers to announce that he was moving to 14 Charlotte Street. The Davies Street premises were to remain open for a little while to sell off surplus stock at reduced prices. The new shop was to be called “The Percy Furniture Bazaar”, no doubt named after Percy Chapel, further up the road. The 1841 census shows John Boulnois and his wife Anne, whom he had married in 1837, living above the shop in Charlotte Street, together with John’s sisters Louisa and Charlotte, 3-year old John Arthur, and two female servants. 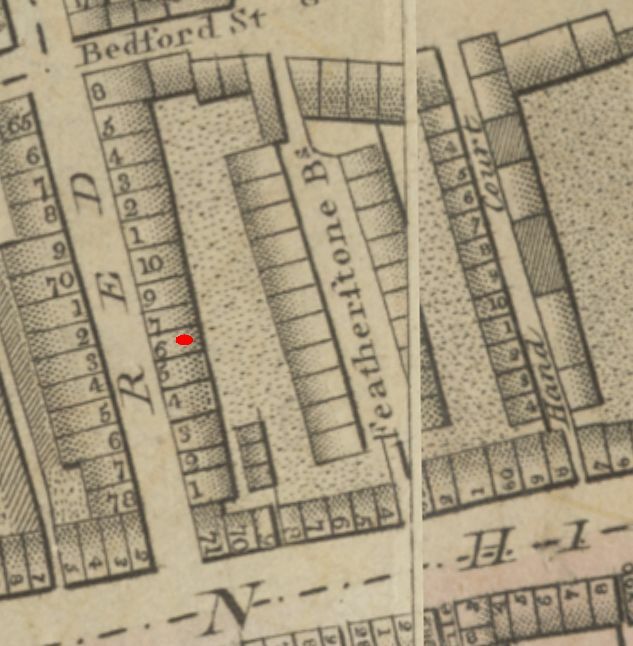 In 1851, John Arthur is at school in Islington, but John, Anne, and Charlotte are still at Charlotte Street, and so are two female servants and a nurse, possibly for Charlotte who died in 1852. Anne died in April 1858 and a year later, John married Mary Anne Williams. In 1861, the census shows a change of address to 30 Sloane Street, Chelsea. John Arthur is by then assisting his father in the shop and in 1865, he married Annie Garrett. In 1871, John senior and Mary Anne are still to be found at 30 Sloane Street, Chelsea; he is listed as an upholsterer employing 12 men and 8 women. John Arthur and Annie are also living in Chelsea, in Markham Square. And what about the shop at 14 Charlotte Street? As we saw in the 1861 census, John Boulnois had moved to Sloane Street, but not just his household, the business as well. 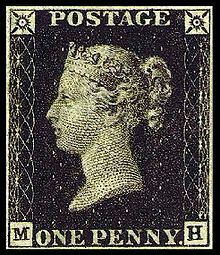 The 1860 Post Office Directory still showed him at 14 Charlotte Street, and, by the way, also at 93 John Street, that is, the next street eastwards that runs parallel to Charlotte Street (now Whitfield Street). The 1861 Post Office Directory lists Boulnois in Sloane Street, not just as upholsterer, but also as undertaker. And the 1863 Post Office Directory adds ‘appraiser’ to his qualifications. According to the tax records, 14 Charlotte Street was occupied from 1861 by Richard Southall, a plumber, and from 1867, after the renumbering of the houses (14 became 30), by Robert Perkins, a builder. 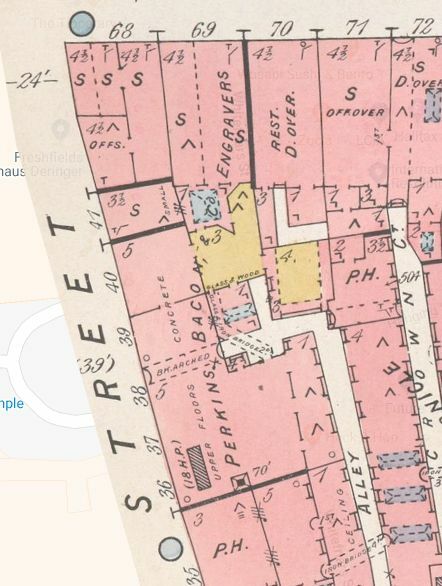 By 1900, when an insurance map was produced, the property was already in use as a restaurant, judging by the letters REST written across the premises. Who stuccoed the house is unclear, but it can still be recognised as the property where Boulnois had his furniture shop. Even the ground floor doors and windows, although modernised, are still in the same place. There are entries for John Boulnois in the database of British and Irish Furniture Makers Online (see here and here), but they can be updated with the information above, stretching his working years considerably from 1831 to 1873 and his addresses to 44 South Molton Street (1831-1839), 14 Charlotte Street (1839-1860), and 30 Sloane Street (1861-1873). (1) The Standard, 29 June 1849. 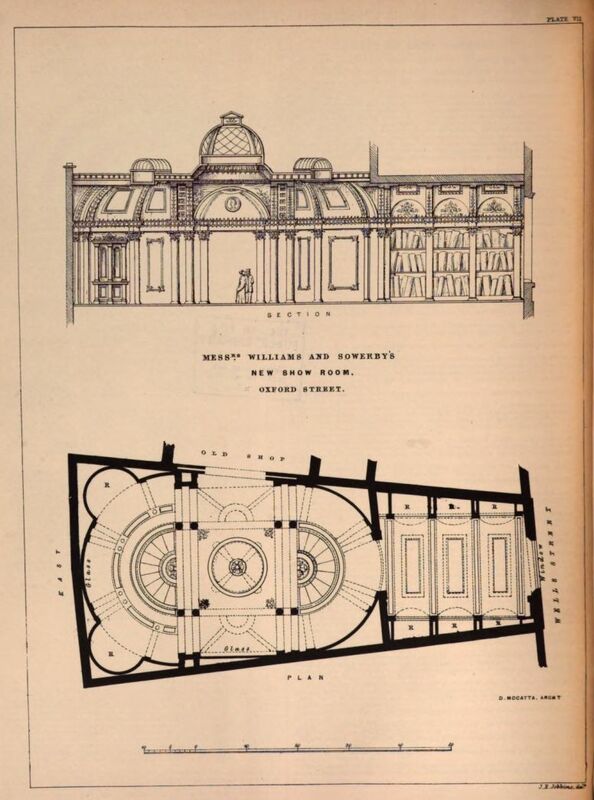 (2) The Athenaeum, 14 November 1840. (3) England & Wales, National Probate Calendar (Index of Wills and Administrations), 1873. (4) England & Wales, National Probate Calendar (Index of Wills and Administrations), 1879. (5) England & Wales, National Probate Calendar (Index of Wills and Administrations), 1886 and 1914. 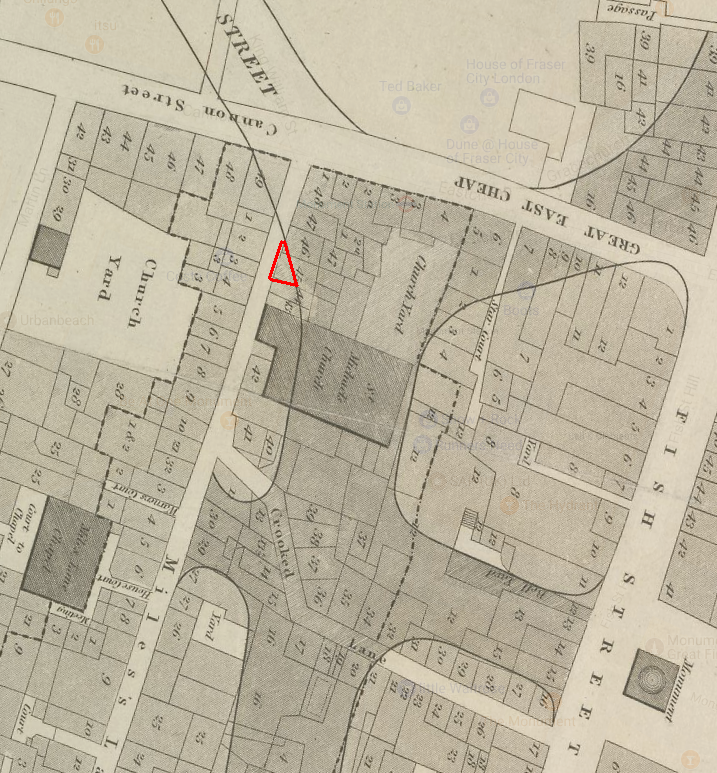 Farley’s property in Blackfriars Road was almost on the corner of what is now Colombo Street, but what was then called Collingwood Street. Christ Church Southwark can be found across from Colombo Street. 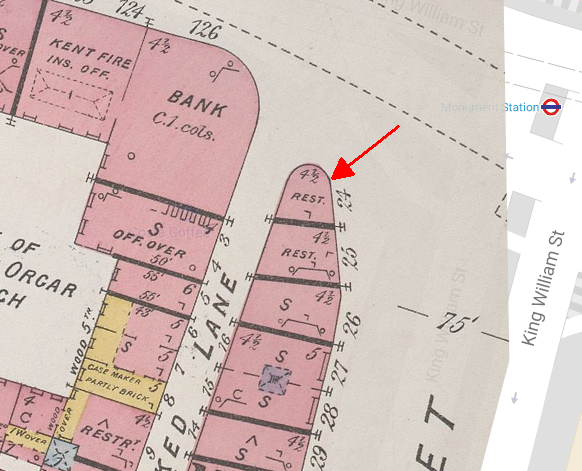 On the insurance map of 1889 below, you can see the property with the church to the north and Collingwood Street bending down towards the south. 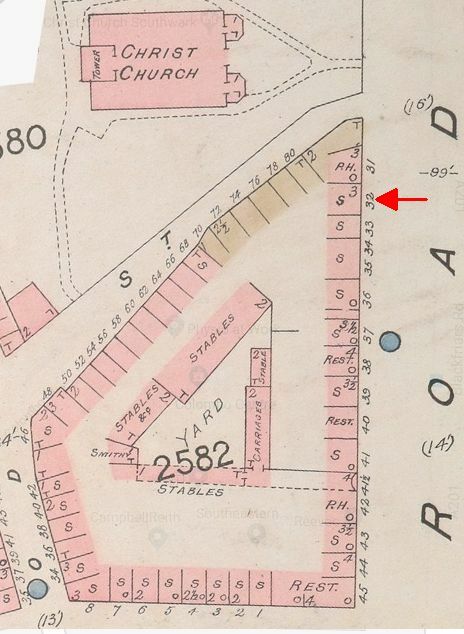 The street at the bottom of the map is Cross Street, now Meymott Street. Farley’s immediate neighbour at number 32 was Mr. Millward, the proprietor of wine vaults (P.H. on the map for Public House). 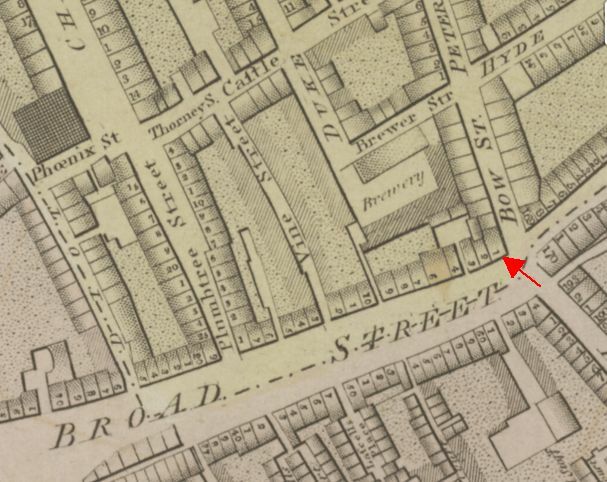 Thomas Farley first appeared at Blackfriars Street in Robson’s Directory of 1823, when that part of Blackfriars Road was still called Great Surrey Street. 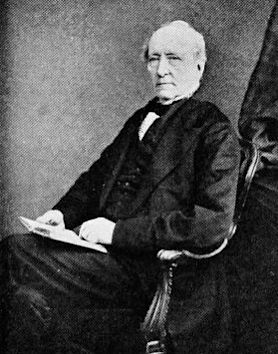 Farley had been a freeman of the Vintners’ Company since 1809 when he acquired his freedom by patrimony, thanks to the membership of his father, John Farley. But Thomas was not a vintner in the sense that he sold wine, he had a toy warehouse. We have already come across another toy dealer named Farley, that is, Henry Farley of 31 Fleet Street, but there does not seem to be an obvious family relationship between the two. Thomas was the son of John and Henry of George, but who knows, maybe the link is further back through the generations. According to the directories, Henry started his career in Blackfriars Road as a silversmith and jeweller, but the 1845 Post Office Directory lists him as hatter and jeweller. 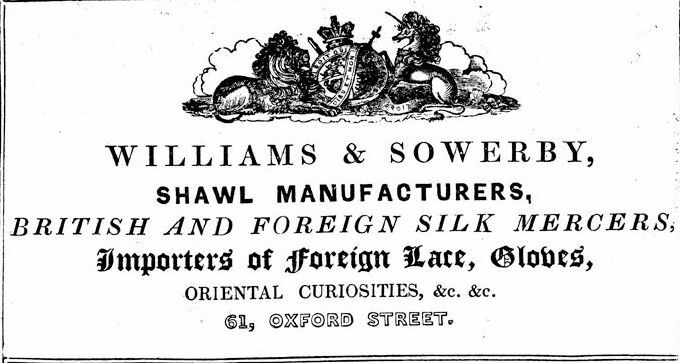 And an advertisement in The Morning Chronicle of 27 July 1847, says he is a hat manufacturer. He apparently had a lodger, a Mr. Jones, who was trying to acquire some houses. Or was he just using Chenu’s address as a convenient collection point for his mail? Jones is certainly not mentioned as living at number 32 in the 1841 and 1851 censuses. The Observer of 19 November 1855 reported on a great fog the previous Thursday and Friday which caused multiple accidents: two trains collided, people fell off boats into the Thames, cabs and carts had accidents, and less than honest people found it an excellent opportunity to rob others with impunity. Chenu had one of his shop shutters taken out, a window glass broken, and “wedding rings, keepers, gold eardrops, and other property, taken away, worth £80”. According to the newspaper report, either a barking dog, or the approach of a police officer disturbed the burglars and they dropped some of the stolen jewellery in the street. 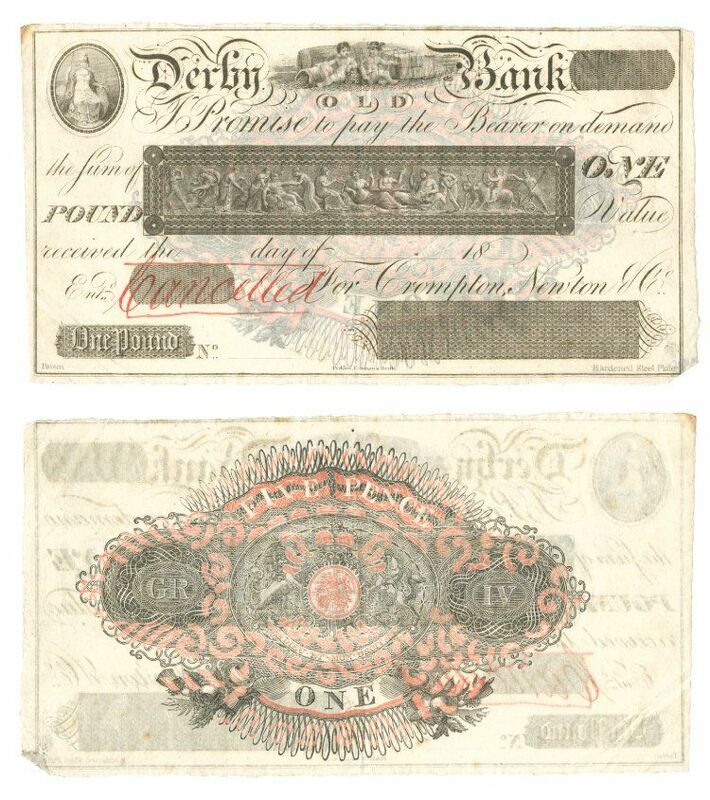 In 1875, Chenu’s bankruptcy case was closed as the London Bankruptcy Court was satisfied that “the whole of the property of the bankrupt had been realized for the benefit of the creditors, and that a first and final dividend of two shillings and eight pence in the pound had been paid to the creditors”. (4) The 1881 census saw Henry and Eliza Ann at Willes Road and his occupation is given as “collector”, no indication what he was collecting, presumably rents or subscriptions. Eliza Ann died in 1887 and, according to the 1891 census, Henry went to live at Langdon Road in a “home for respectable aged people”. He died in 1901 and that is the end of the story as far as this blog post is concerned. (1) The London Gazette, 1 January 1865. (2) The London Gazette, 4 October 1869. (3) Old Bailey case t8700110-171. (2) The London Gazette, 26 March 1875. -5 Walker’s Court, Berwick Street, Soho (1828 and 1829 Old Bailey cases (t18281204-230 and t18290115-25), Wilcoxon testified “I live in Walker’s-court, St. James'”; last mentioned for Wilcoxon in the 1851 Post Office Directory. The first and the last shops in this list were not mentioned by Tallis as he did not produce Views for those streets, so we will leave those for the moment. First mentioned for Wilcoxon in a Sun Fire insurance record of 1829. Wilcoxon testified in an 1828 Old Bailey case (t18281204-22), “I am a shoemaker, and live in Oxford-street”. He does not say at what house number, but the claim seems to contradict another Old Bailey report of the same day where Wilcoxon said he lived in Walker’s Court. Last mentioned for Wilcoxon in the 1848 Post Office Directory. First mentioned for Wilcoxon in a Sun Fire insurance record of 1829. In an 1834 Old Bailey case (t18341205-311) the shopman, George Samsome, said “I am shopman to Mr. Ralph Wilcoxon, who is a shoemaker, and lives at No. 303, Oxford-street” and “I have possession of the house all day, and two boys sleep there at night—Mr. Wilcoxon does not sleep or take his meals there”. One shop-boy, Dennis Crowley testified, “I am shop-boy to Mr. Wilcoxon, who lives in Tottenham-court-road”. Philip Jewell, the other shopboy said “I then went to No. 289, Oxford-street, to acquaint Mrs. Wilcoxon—I left the policeman at the door—I came back—Mr. Wilcoxon was not at home”. Three different addresses for Wilcoxon mentioned in one court case; something must have gone wrong in the transcription of the answers each of the shop servants had given. For one, it seems unlikely that they did not know where their master lived. And another peculiarity is the fact that Crowley said that there was only one shop window that was fastened with a catch on the inside and had shutters on the outside. Judging by the elevations in the Street View, this was far more likely to be number 289 than 303. So, was the shop robbed at number 289 and did Wilcoxon live at the far larger property at number 303? Most likely. The property is last mentioned for Wilcoxon in the 1848 Post Office Directory. First mentioned for Wilcoxon in a Sun Fire insurance record of 1834, but an 1826 insurance record for 99 Regent Street mentions “other occupier: shoemaker” without giving a name. Last mentioned for Wilcoxon in the 1848 Post Office Directory. First mentioned for Wilcoxon in a Sun Fire insurance record of 1830 ; last mentioned for Wilcoxon in the 1851 Post Office Directory. -11 High Street, Islington. 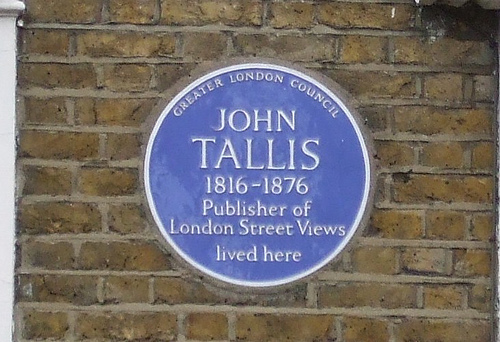 Tallis’s Street View lists no less than three numbers 11, occupied respectively by a hosier, a hatter and a shoemaker. It is tempting to promote the last one to Wilcoxon’s predecessor, but a decisive identification must await further research. First mentioned for Wilcoxon in the 1845 Post Office Directory; last mentioned for Wilcoxon in the 1848 Post Office Directory. Sounds like a heart attack to me. 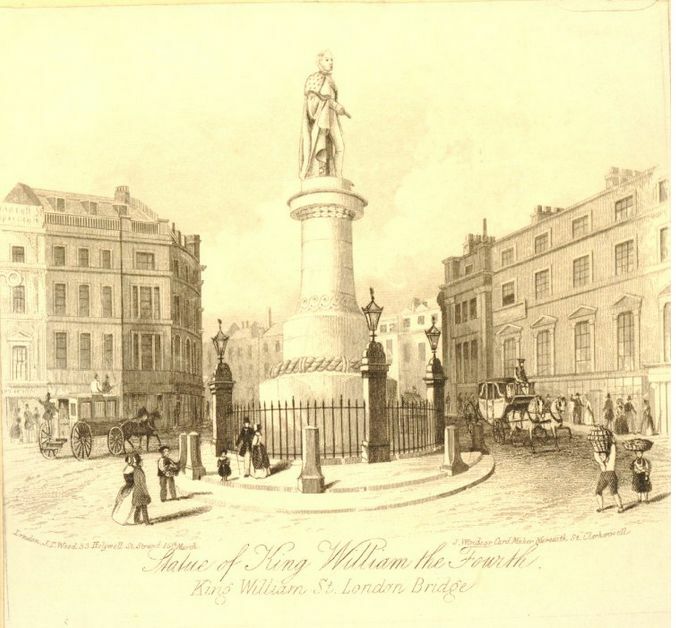 He left his wife Hannah the “goodwill and stock in trade of the business carried on by me in King William Street”. He does not separately mention the other shops, but I gather they were considered to be part of the King William Street business as Mrs Hannah Wilcoxon is listed as the proprietor of all the shops in later directories. His wife also gets the interest in Claremont Cottage, Wandsworth Road, and his mother the interest in the Paragon, Blackheath. He does mention lots of other houses and leaseholds in his possession which he distributes among his four children, Arthur (officially Arthur Samuel), Ralph, Hannah and Catherine. His executors are to take care of all these properties until the children reached the age of twenty-five when their inheritance was to be turned over to them. (4) Because he died so suddenly, his two youngest daughters were not mentioned in his will. He had no doubt planned to make a new will, but had not yet got round to it, so Hannah remedied the omission in her will, “I am especially desirous of making a provision for my two youngest children Eliza Wilcoxon and Emily Wilcoxon who from the circumstance of their being born after the execution of the will of their late father have by the disposition which he therein made of his property been excluded from any part of portion in his estate”. (5) She leaves the two girls all her personal estate, with the exception of an annuity for her sister. 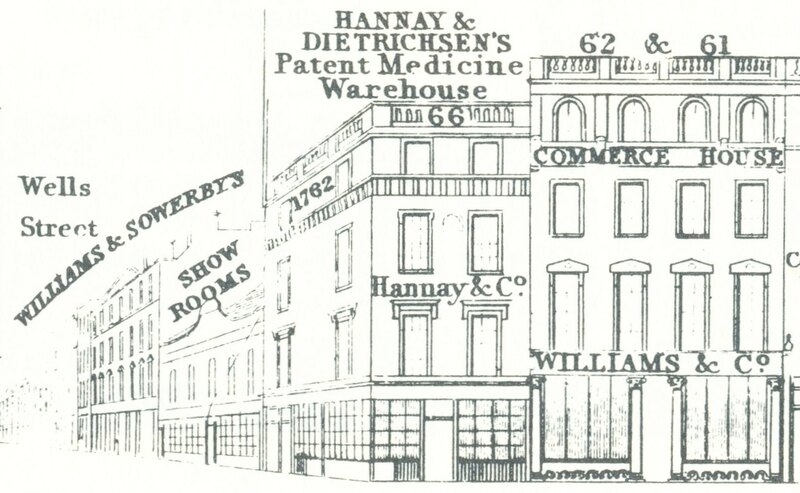 After the death of her husband, Hannah continued the shoe shops and the 1848 Post Office Directory gives the following addresses after her name: 60 King William Street, 289 and 303 Oxford Street, 99 Regent Street (Quadrant), 93 Tottenham Court Road, 5 Walker’s Court and 11 High Street, Islington. By 1851, however, that is after her death – she died in 1849 – only 60 King William Street, 93 Tottenham Court Road and 5 Walker’s Court were listed after her name. The emporium was reduced even more after that and the 1856 Post Office Directory just lists Arthur Wilcoxon at 60 King William Street. He had probably been running that shop with his brother Ralph who had died in November 1850, just 31 years old. (1) Old Bailey case t18351214-255. (2) Old Bailey case t18400406-1281. (3) Daily News, 16 September 1846. (6) England & Wales, National Probate Calendar (Index of Wills and Administrations), 1886. The executors were his brothers-in-law, George Martin Hughes (husband of Catherine) and James Reynold Williams (husband of Hannah). 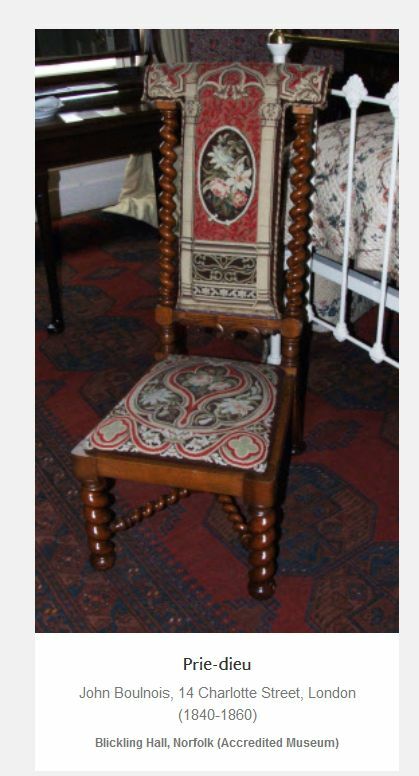 The estate was valued at over £11,000, but later resworn at just over £10,000. Street Views: 1, 1 Suppl. and 18 Suppl. Although the title of this post(1) suggests there was a firm called ‘Ruddick and Heenen’, that is not the case, although the names are linked. From about 1834, Ruddick & Co. were trading as a snuff warehouse from 24 King William Street and one directory (Pigot’s) lists them as “Ruddick Ellen & Co, tobacconists”. By then, however, Ellen Ruddick was already married to James Heenan and another section of the same directory lists the shop for James Heenan. 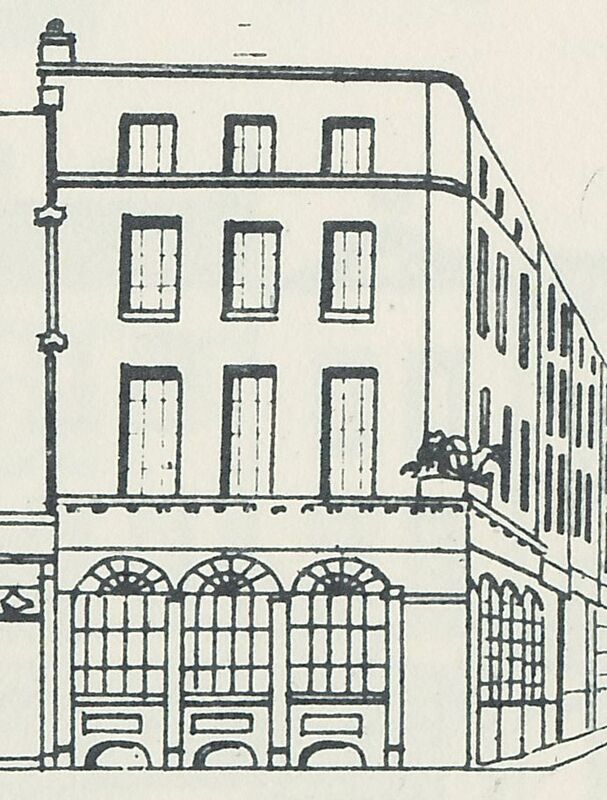 Another directory (Robson’s) and Tallis (Street View of 1839) persist in calling the business Ruddick & Co. But who was Ellen Ruddick and was she running the tobacco shop on her own before Heenan came along? Ellen Ruddick’s father, John Ruddick, had died in 1826 and seems to have favoured his daughter Ellen over his four sons as she is to have 800 pounds while the sons only get £200 each. She is also to get the household goods and the rest of his estate after the death of her mother Hannah. (2) Perhaps the sons had already been provided for in other ways. 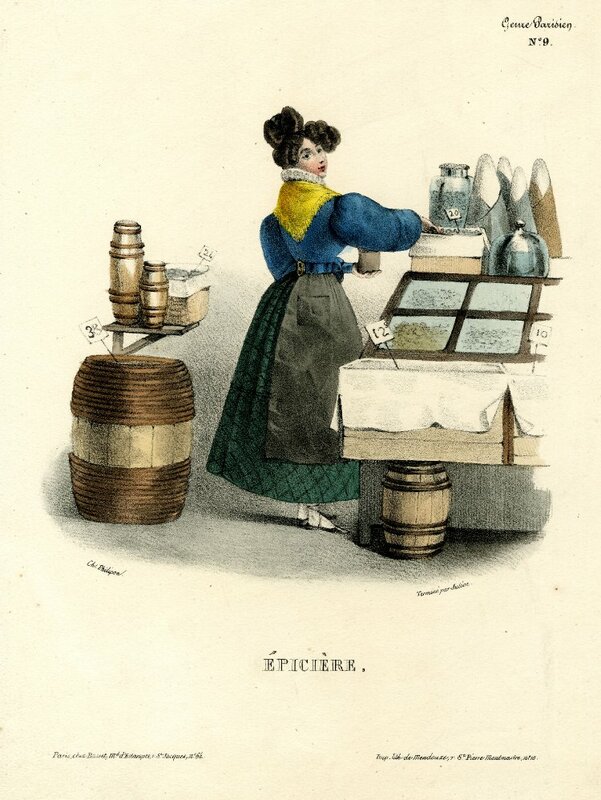 Ellen was only 15 years old when her father died, so too young to set up a business of her own, but she, probably together with her mother, grabbed the opportunity to set up shop in the new development of King William Street, which was built in the early 1830s to ‘improve’ the northern approach to the new London Bridge. Their property was only small, but no doubt large enough for a tobacco shop. How Ellen came to meet James Heenan is unclear, but on 18 October 1838 they were married at St. Mary, Islington. The marriage registration lists James as of Prince’s Row, Kennington(3) and Ellen as of Palmer Terrace, so she did not live above the shop. The tax records for 24 King William Street up to 1838 give Ruddick & Co, but from 1840, the property is listed for Heenan & Co. I am guessing that the ‘& Co.’ part of the name had something to do with the fact that mother Hannah was still alive and Ellen did not yet have the full rights to her inheritance. Hannah was living with Ellen and James at number 24 at the time of the 1841 census, and so was little Ellen Mary who was born, or at least baptised, in September 1840. The little girl unfortunately died in early November 1847. James and Ellen had one other child, son William Henry (born June 1842) who survived his parents and was still alive at the time of the 1911 census. He is probably the William H. Heenan who died in the last quarter of 1913. 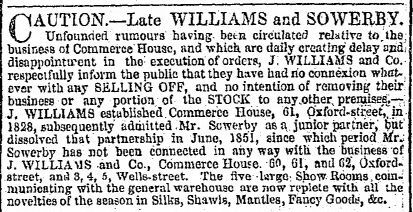 So, the Heenans ran the small shop in King William Street, but in 1843, an advertisement tells us that they have opened a branch in Regent Street. The advertisement mentions a batch of cigars that have been purchased from Lopez and M’Kinnell. These gentlemen were wine merchants in Fenchurch Street, but apparently also dealt in Lopez cigars. The partnership between Lopez and M’Kinnell was dissolved later in 1843 and they may already have been offloading some surplus stock. 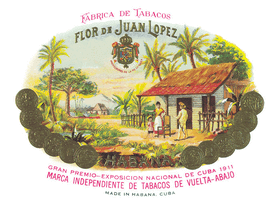 In January, 1843, another tobacconist, J. Hudson of 132 Oxford Street, claimed to have taken over the complete stock of Lopez and M’Kinnell and his was therefore the only place in London where the real Lopez cigars could be obtained. (4) But, judging by the advertisement of Heenan, the Lopez cigars were not as exclusively available as Mr. Hudson would have wanted. 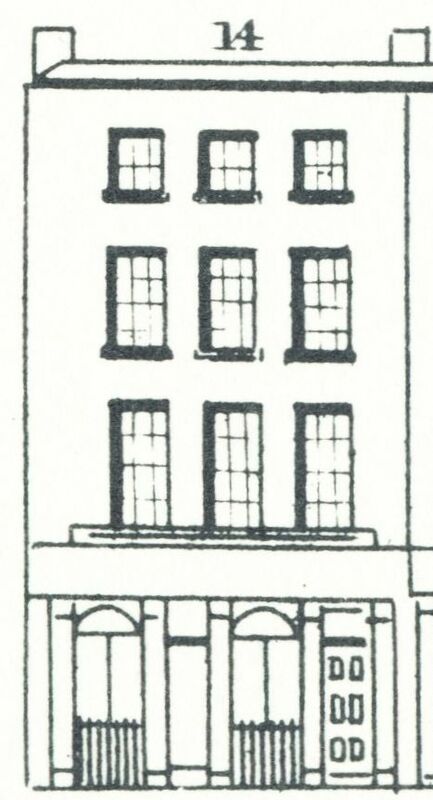 Another advertisement was entered by Heenan in April, 1843, in which he announced his desire to let the upper part of 30 Regent Street, consisting of eight rooms, including kitchen. It is therefore no wonder that the Tallis Supplement has both Heenan and the London and Windsor Railway Company at number 30. They probably rented part of the building for their office. It is quite possible that Heenan entered into a partnership to be able to afford a second shop, although it is uncertain when the partnership with Philip Hargrave Curtis started. It certainly ended on 18 May 1850 with Heenan to continue on his own. (5) The 1851 census lists two ‘assistants’ living above the shop in Regent Street, presumably shopmen in the tobacconist’s, and, separately, two brothers, Thomas and Joseph Hensley, leather merchants, with a servant and an apprentice. By that time, Heenan was no longer living in King William Street, but in The Cottage, Englands Lane, Hampstead. 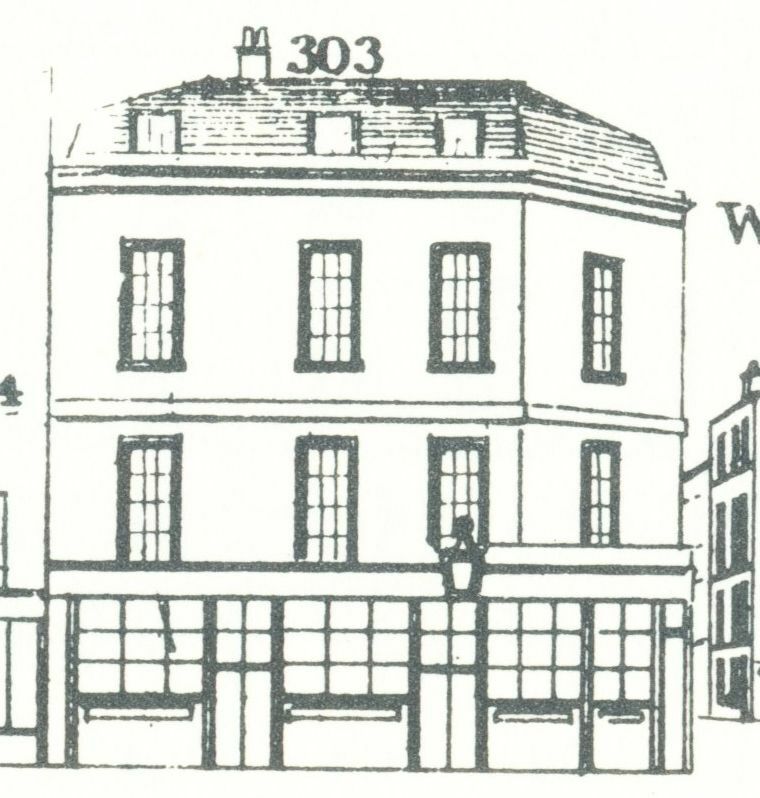 The shop in King William Street was minded for Heenan by Thomas Penn. 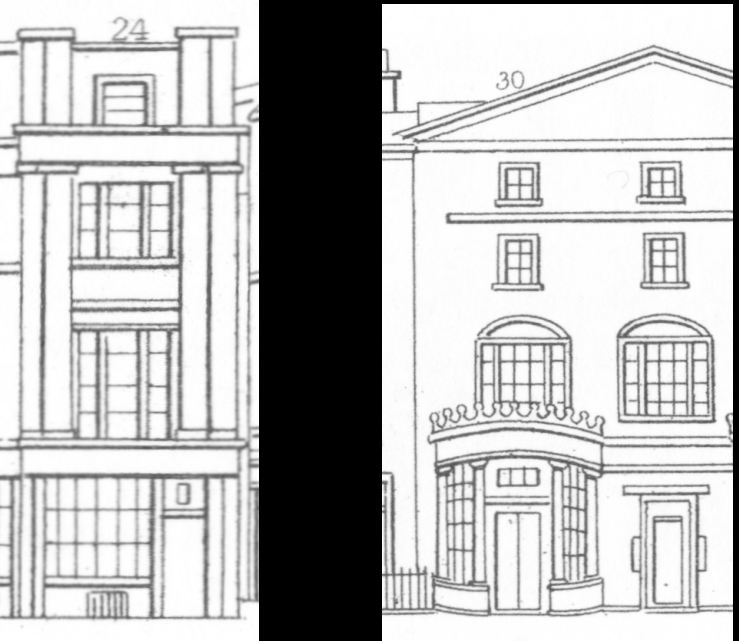 The two shop elevations are shown at the top of this post: 24 King William Street on the left and 30 Regent Street on the right. Click on the picture to enlarge. (1) Research for this post started with a query by one of my readers who is involved in the one name study on the surname Heenan, see here. Some of the biographical information has been supplied by her, for which my thanks. (3) James Heenan, Gent., insured 39 Princes Road, Kennington, on 13 July 1840. Although it is fairly unlikely that a tobacconist who has just started a business is called ‘gent’, it probably does refer to the tobacconist. The record also refers to a Benjamin Heenan. The 1851 census lists a John Emanuel Heenan at 38 Princes Road and Benjamin Heenan at 39 Princes Road. Premises in Princes Road were mentioned in the will of John Heenan, tailor, who died in 1813 (PROB 11/1542/326). James, Benjamin and John Emanuel may have been brothers. (4) The Standard, 10 January 1843. 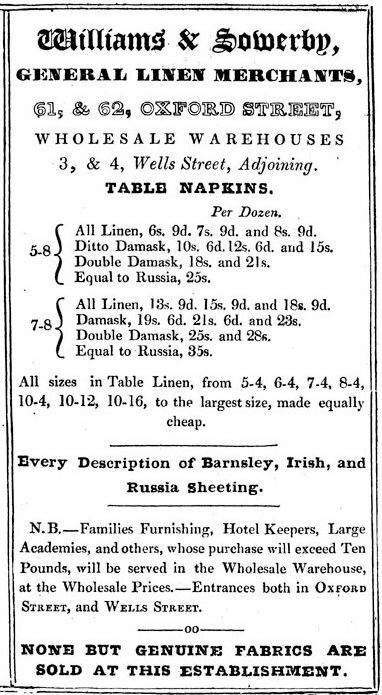 A repeat advertisement appeared in The Era, 2 July 1843. (5) The London Gazette, 14 June 1850. The relation with the Curtis family remained cordial and James Heenan was one of the executors of one Francis Edward Hargrave Curtis who died in 1862. (6) England & Wales, National Probate Calendar (Index of Wills and Administrations), 1874. Probate of the estate, worth under £12,000, was granted to widow Ellen. She apparently left it unadministered and a second probate was granted to son William Henry in 1902. The value had by then dwindled to £144. (7) England & Wales, National Probate Calendar (Index of Wills and Administrations), 1891. William Henry was the executor and her personal estate was valued at £40. The houses in Lamb’s Conduit Street have been renumbered in the 1860s and what was number 42 is now 83 Lamb’s Conduit Street, a property with a Grade II listing (see here). It sits snugly between two far more modern buildings, but looks more or less the same as it did when Sampson Low had his business there, despite the new shopfront that the listing text dates to the 20th century – you could have fooled me. The interior still retains some 18th-century features, such as the staircase and some panelling. On 3 September, 1782, Sampson Low, son of David, perukemaker from Ireland, was apprenticed to Jessintour (also Jessington) Rozea. This Rozea had his business at 91 Wardour Street and seems to have retired in 1786 or thereabouts as in that year J. Denew and A. Grant take over the printing business in Wardour Street. 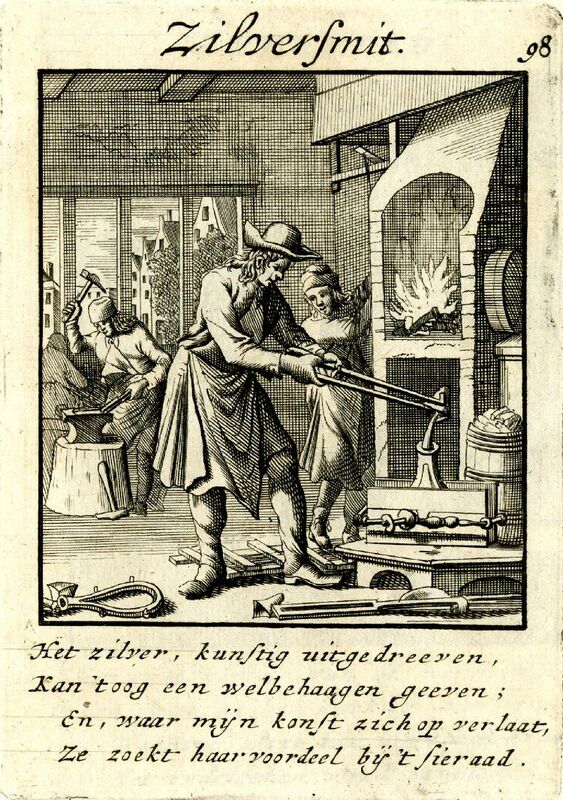 Apprentice Sampson Low is officially turned over to another master, Webster Gillman, on 3 February 1789. He must have been made free of the Stationers’ Company soon after that, probably after the required term of seven years, but he did not take up the freedom of the City until 7 October 1794, that is, more than two years after he started working for himself. 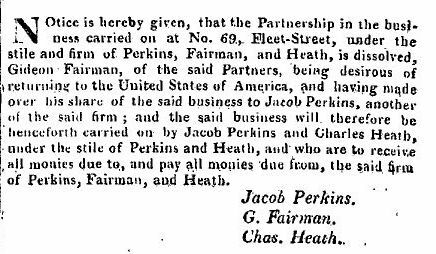 The earliest evidence for him having his own business is an advertisement in The World of 24 December 1791 and the fact that in March 1792 he paid the duty for having an apprentice himself. He was then listed as letter press printer at Great Portland Street, which was outside the actual City and he had therefore no need to become a freeman of the City. 1792 is also the first year in which he is mentioned in the tax records for Great Portland Street. His earliest dated publications are from 1793: The Book of Common Prayer and A Catalogue of the Genuine Collection of Antient and Modern Coins & Medals. The latter publication did not mention Low on the title-page, but unobtrusively at the top of page 3. In 1794, Low married Mary Ann Sheldrick from Dartford, Kent, and his son Sampson was born in 1797. To distinguish the two Sampsons, the father will henceforth be mentioned as Sampson (I) and the son as Sampson (II). Sampson (I) died in late 1800 or early 1801 and was buried on 5 January 1801 at St. James, Piccadilly. He had been trading since 1796 from Berwick Street, Soho. His business was probably sold by the executors, at least, it is no longer mentioned in advertisements or directories, but when his son grew up, he had the same bookish interest and was for a time apprenticed to Lionel Booth who ran a circulating library in Duke Street, Portland Place, and who also maintained the Register of Pamphlets and Newspapers at the Stamp Office. After Booth’s death in 1815, his son, also Lionel, continued the library. Sampson (II) worked for a time at Messrs. Longman, but in 1819, he set up his own bookshop in Lamb’s Conduit Street. According to his later partner Marston, his mother, who had remarried in 1802 to William Brough, kept house for him in the early years. In 1821, Sampson (II) married Mary Stent, but his mother continued to visit the bookshop and library frequently. 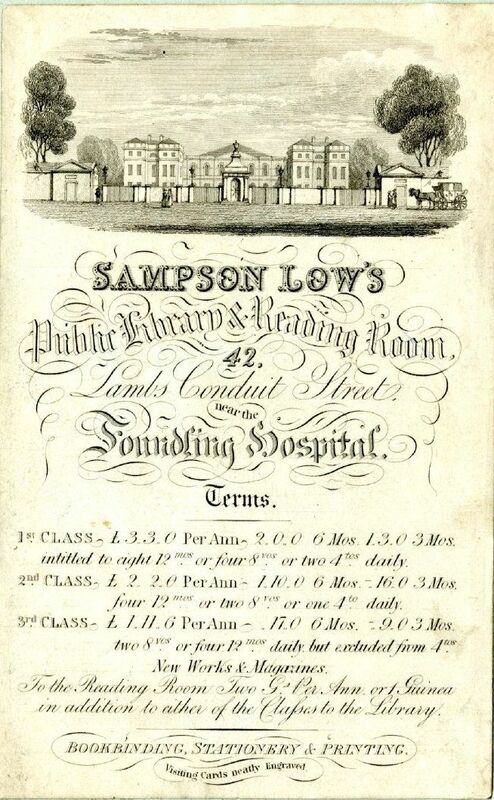 Early advertisements for Sampson (II) suggest that in the early years he just sold and published books, but on 27 June 1822, he entered an advertisement in The Morning Chronicle announcing that he had “that day opened a commodious room, built expressly for the purpose, which will be regularly supplied with the morning and evening newspapers [… etc.] Cards of terms may be had on application”. One such card is probably the one shown above with the various subscription options. Low remained at Lamb’s Conduit Street till 1849, when he gave up the reading room and library and established himself at the corner of Red Lion Court and Fleet Street, only to remove a few years later, in 1852, to 47 Ludgate Hill. But that was not the end of the moves as the viaduct for the London, Chatham and Dover Railway Company was built right across the houses in Ludgate Hill and Low, by then in partnership with Edward Marston, moved to 14, Ludgate Hill. 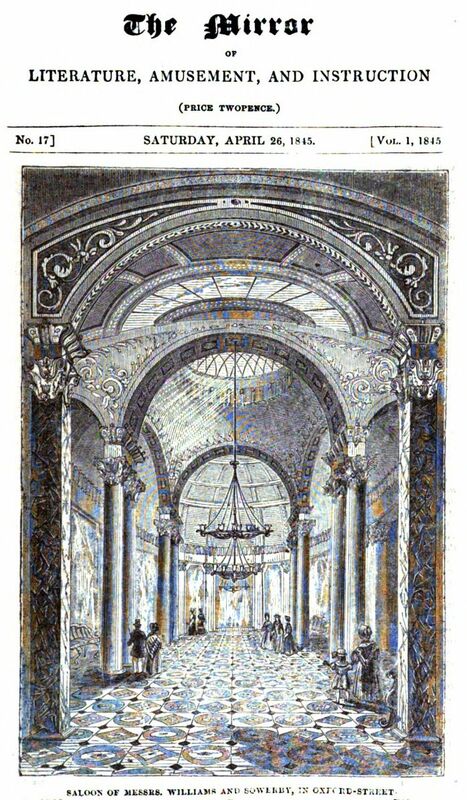 The firm moved again, in 1867 to 188 Fleet Street, and in 1887 to St Dunstan’s House, Fetter Lane. The business dealt with many authors who are now household names, such as Wilkie Collins and Mrs Gaskell. More on Low’s publications and Marston’s dealing with these and many other authors can be read in the latter’s biographical After work; fragments from the workshop of an old publisher (1904; online here). Low retired in 1875 and died at his home in Mecklenburgh Square in April 1886. He had outlived his wife and his three sons, Sampson junior, William and Walter. 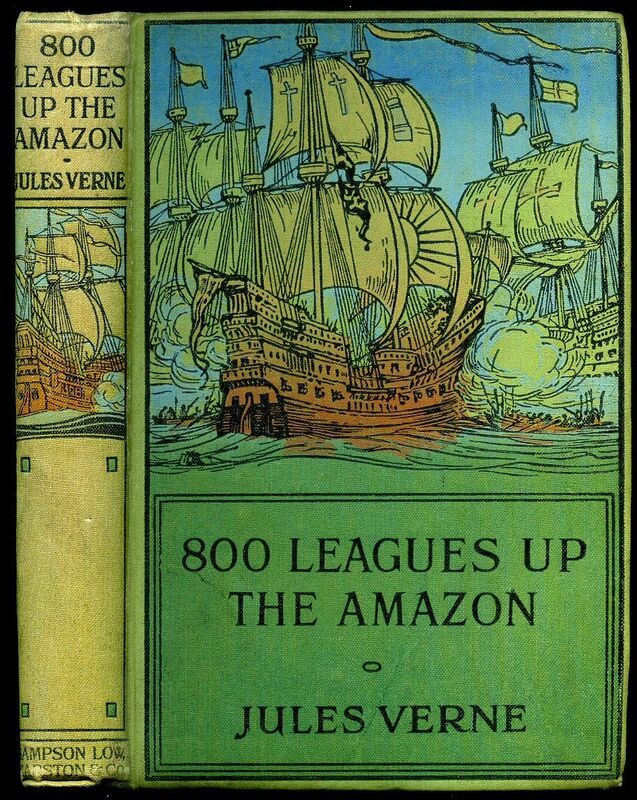 His estate was valued at over £24,000, which seems modest for a successful publisher, but, as Marston said, “he was not the man to accumulate a large fortune in trade; his zeal and energy took a less selfish and more philanthropic turn”. Low had used his energy into establishing a fire service and worked as a Sunday school teacher. His partner Edward Marston was one of the executors of the will. The profitable business continued for may years with various other partners until the 1950s when it became part of the British Printing Corporation. Unfortunately, Robert Maxwell got his hands on it in 1981 and the long-standing firm was stripped of its assets and wound up after Maxwell’s death and subsequent bankruptcy. But, history repeats itself in a way, and where there was a gap between the working years of Sampson (I) and Sampson (II), there was also a gap between the termination of the business and the rebirth in 1997, when a descendant brought the name Sampson Low back to life as a new publishing company (see here). Sampson (I) and (II) would have been proud.